Here’s a fun new recipe for you guys today: a No Bake Blueberry Custard Pie that is vegan & gluten free to boot! 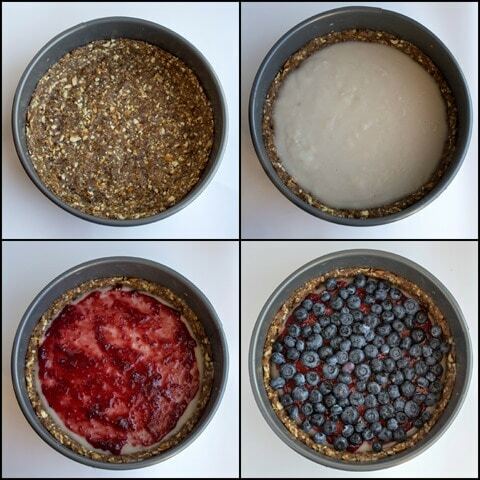 Have you ever made a vegan pie crust before? I love vegan pie crusts because they are so easy (and healthy – chock full of healthy fat!) to make and taste great, too. No baking required! This one is made with raw almonds and walnuts, dates (to stick it all together! ), and a little shredded coconut, too. As for the creamy vanilla custard filling, it’s kept vegan with Almond Breeze almondmilk. The unsweetened vanilla almondmilk worked great here, but I bet their almond coconut milk would be fabulous, too, since this recipe includes a fair amount of coconut. Another great thing about this recipe is that you can make it a day or two ahead up to the crust/filling steps (at which point it needs to be refrigerated anyway, for at least an hour). Then all you have to do the day of is throw the jam/blueberry mixture on top. Easy! Love recipes that don’t have you scrambling to do everything the day of. Here’s the recipe. I hope you (and your guests) love it, too! 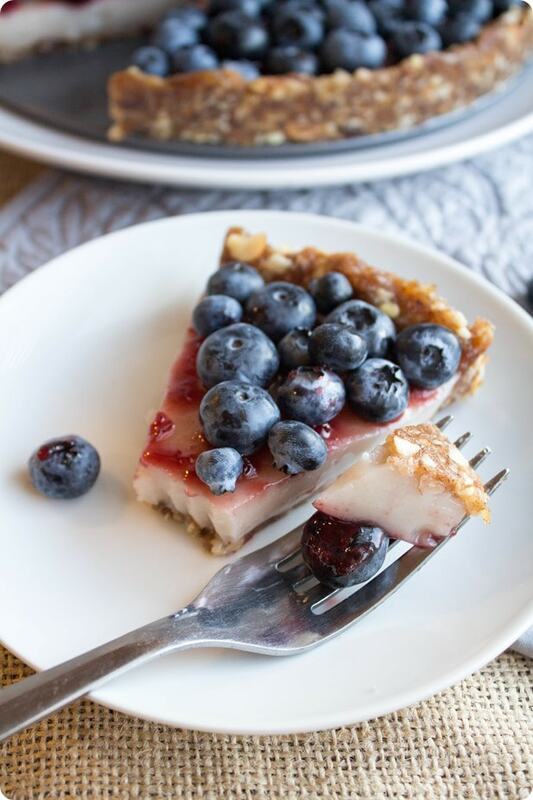 Prep Time: 20 minutes + 1 hour in fridge This no-bake pie is perfect for summer days when you don’t want to heat up the oven. 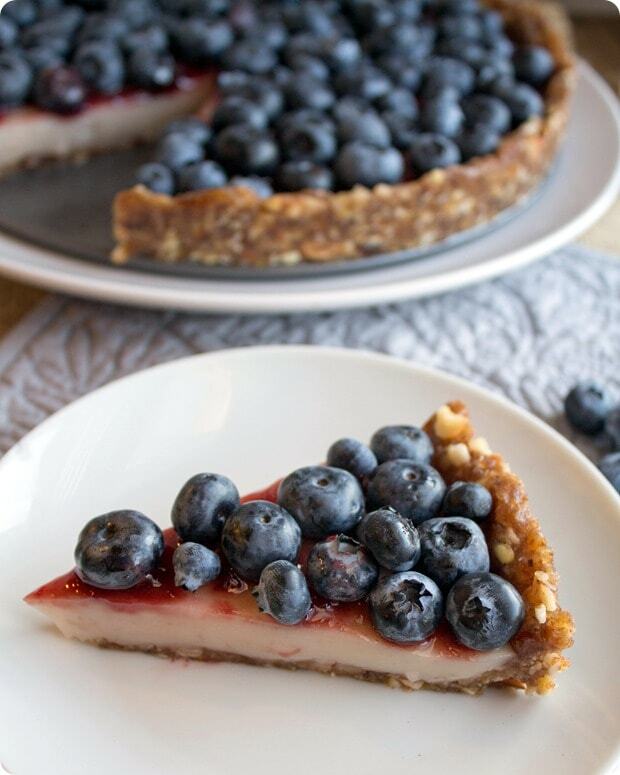 With the crunchy crust, creamy vanilla filling, and juicy blueberry topping, you won’t believe it’s vegan and gluten free, too! Plan a few hours in advance and you have a refreshing dessert everyone will love. 1. In a food processor, process all the crust ingredients until finely ground. 2. 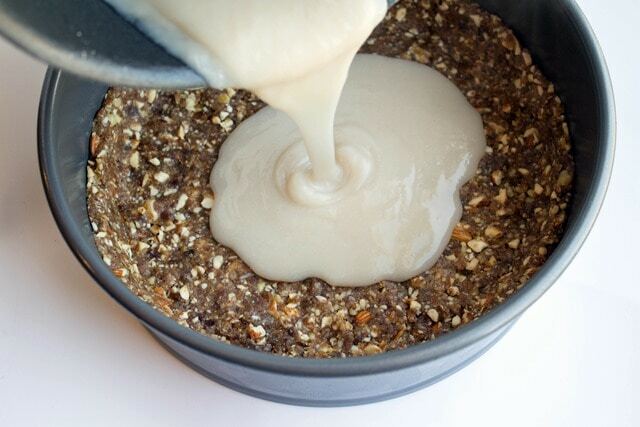 Press the crust mixture into a greased 9 inch pan with a removable bottom. * Set aside. 3. In a medium pot, combine the sugar and cornstarch, whisking to remove any lumps. Whisk in the Almond Breeze. 4. Turn the heat to medium-high and cook until the Almond Breeze mixture comes to a boil. Reduce the heat to low and whisk vigorously until the mixture thickens, about 3-5 minutes. 5. 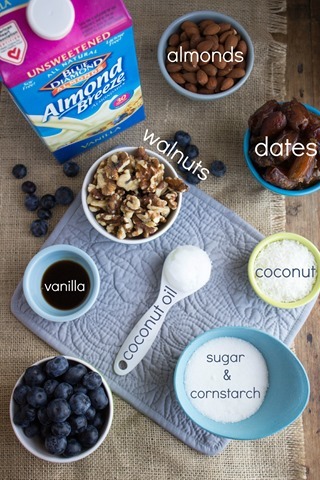 Remove the Almond Breeze mixture from the heat and whisk in the coconut oil and vanilla extract. 6. Pour the filling evenly into the crust, then let cool. Once cool, wrap tightly with plastic wrap and refrigerate for at least one hour. The pie can be prepared up to this step the day before serving. 7. Warm the jam in the microwave for 30 seconds, until it is liquid. 8. 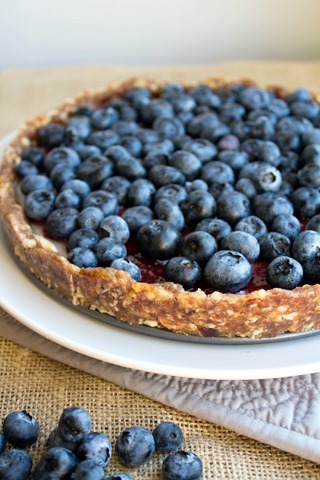 Spread the jam on the cooled filling using a spoon or spatula, then top with the fresh blueberries. *A note: this recipe can also be made in a normal pie pan but the crust will hold together better in a pan with a removable bottom (e.g. a springform pan). What’s your favorite pie recipe? Feel free to share links! 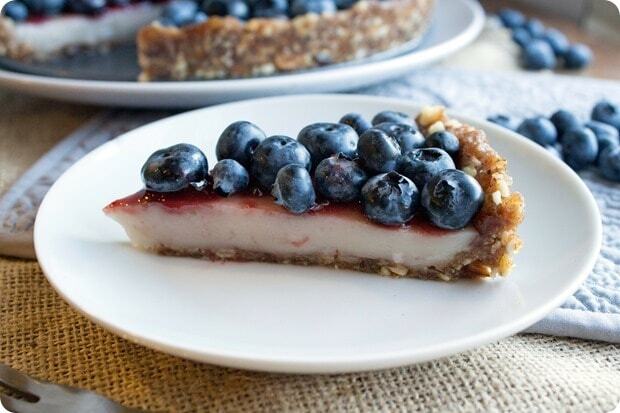 Love that the filling is pretty much just created with almond milk! 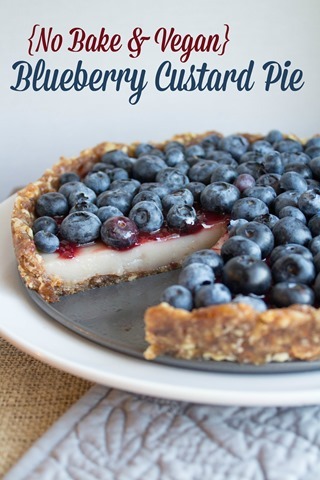 It looks irresistible for a summer treat! Yum! This looks so delicious. Have a great Memorial Day! I’ve never tried a vegan crust before but I think this looks amazing! I love blueberries so I’m sure I’ll love this! Not a big fan of coconut. Could I sub out the coconut oil for something else? Does coconut oil make the whole dish taste coconut? It’s definitely coconut-y since there is dried coconut in the crust too. I’m not sure what else you could use – maybe butter instead of the coconut oil and leave out the dried coconut? Good luck! Thanks for the recipe. It’s just what I’m looking for – healthy and easy! yet again, your photos are just stunning! I’m a big fan of blueberries and i love the vegan crust idea. But i think if i made this i might do a non vegan custard. This surely gives me inspiration though. This looks really good. Do you think I could sub coconut sugar for the sugar, or leave it out completely? I wouldn’t leave it out completely but coconut sugar might work! ohh that looks so good. Since going GF i never make desserts anymore. Never. I have never made a vegan pie crust before, but MAN does this look yummy!!! Can I replace the shredded coconut with something else? I’m sure one could use peaches or strawberries on top as well, correct? Not sure about the shredded coconut, but yes to the fruit! Can I use the crust to a baked cheesecake? You can try. .. I think it would work okay! Can I use regular sugar or Splenda in it instead of vegan cane sugar? And do the nuts have to be raw? Regular sugar work would! Don’t use Splenda, though – wouldn’t taste very good. The nuts can be roasted if you want!